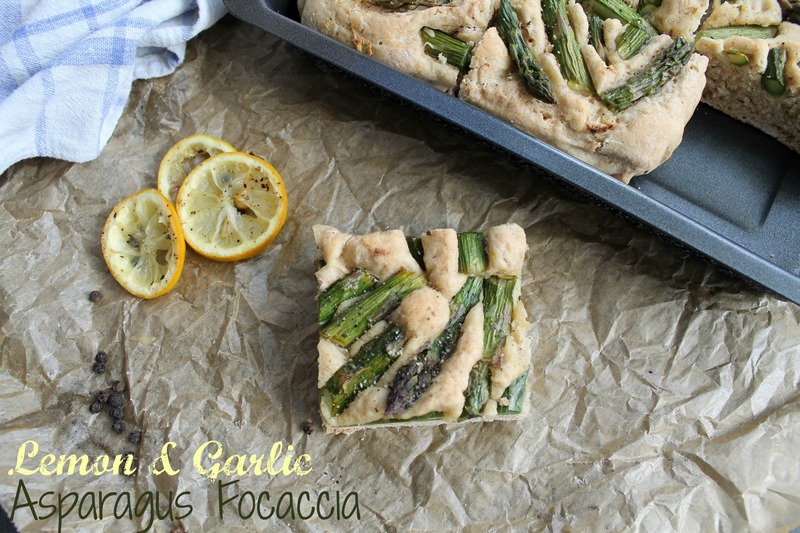 So for today I am sharing my recipe for Lemon & Garlic Asparagus Focaccia. I love how the lemon and garlic plays with the asparagus flavor. And the Focaccia is deliciously soft and just so morish! It makes a great appetizer, side dish or you can just stuff your face directly from the baking tray like I usually do. 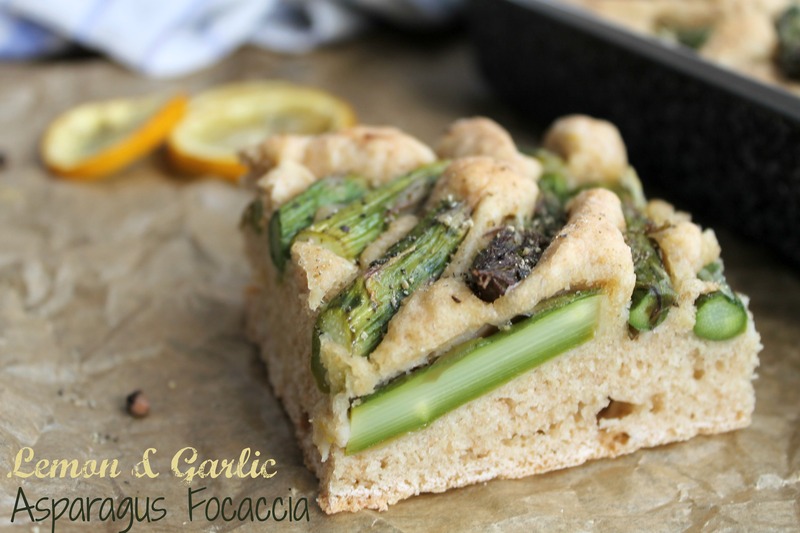 The Focaccia is of course not only for asparagus. I like to top it with cherry tomatoes, cheese, rosemary, olive oil and garlic or olives. There’s no limit to your imagination 🙂 And did I already mention that this is a vegan recipe? 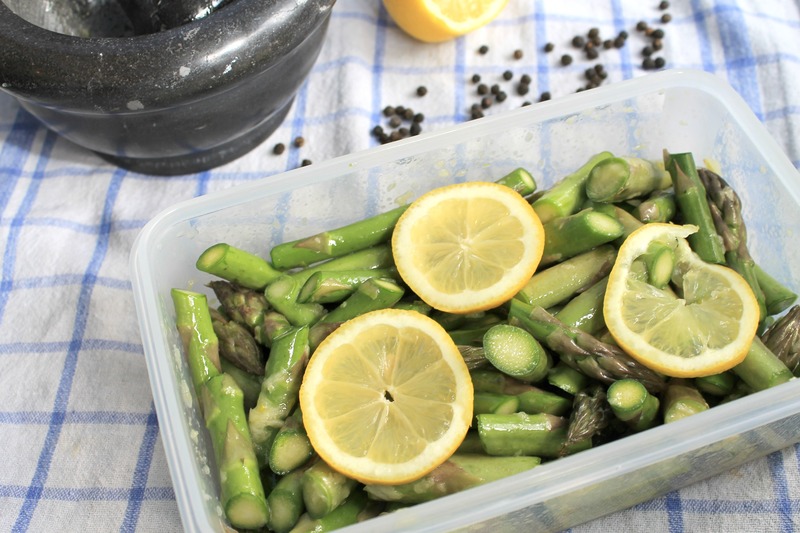 Give the oil concoction and lemon slices over the asparagus, cover the lid and shake well. All the asparagus should be moist. I hope you all spend a nice and relaxing Easter weekend and get to spend some quality time with friends and family. Juli, this looks absolutely delicious! I love a good savoury loaf, and focaccia is one of my favourites- there is one here with sea salt, rosemary and olives which is absolutely blissful! I could eat asparagus by the tonne…when roasted like crazy, they turn as thin as barbie hair. This looks gorgeous! I’ve always wanted to make focaccia, must try to make my own one day. You should try it. It’s really good. And of course you can sup the asparagus for anything else! This look seriously amazing! I love that you used spelt flour too. I’ve been scared to make bread, the last time I tried years ago using yeast it was a major fail but may be time to try again.